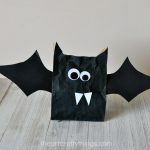 Our Halloween crafting has been in full swing the last couple weeks. 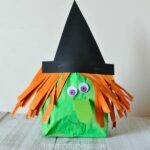 We’ve already had fun making a cute witch, Frankenstein and bat, but our latest might be my most favorite yet. 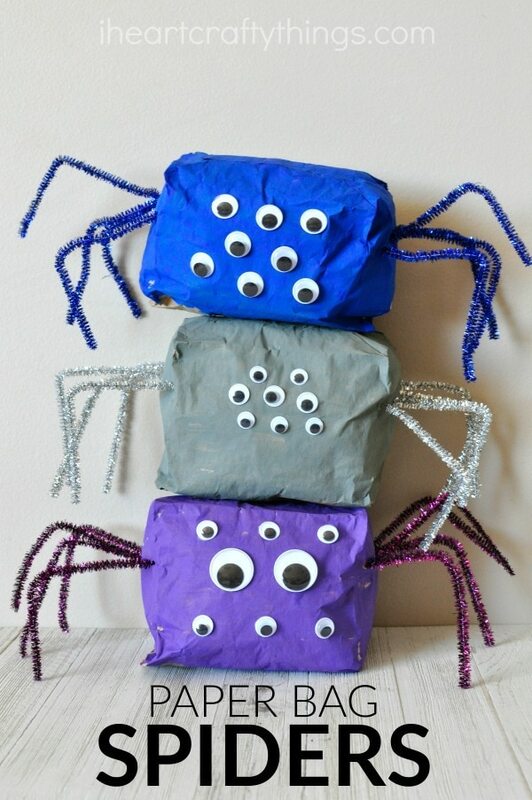 This stuffed paper bag spider craft is great as a spooky Halloween craft but it would also be good for any time of the year after learning about spiders or reading a spider-themed children’s book. They look awesome set up on a shelf as a Halloween decoration or you can tape a piece of string to the top of them and have them hanging down somewhere for more of a creepy effect. 1. Start by cutting strips of newspaper, crinkle them up and stuff your paper bag till it is about one-third to one-half full. Cut the bag down close to where it is stuffed, staple the bag closed and fold the end over so it’s flat. 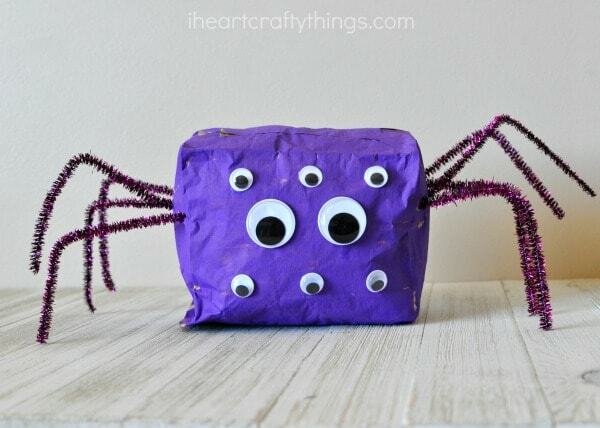 We used the stapled shut side as the bottom of our spider. 2. 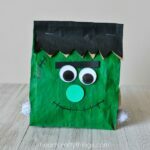 Paint the front, top and sides of your stuffed paper bag. Set it aside to dry completely. 3. When your paint is dry, cut four pipe cleaners in half for the spider legs. Use a toothpick to poke four holes on each side of your stuffed paper bag. 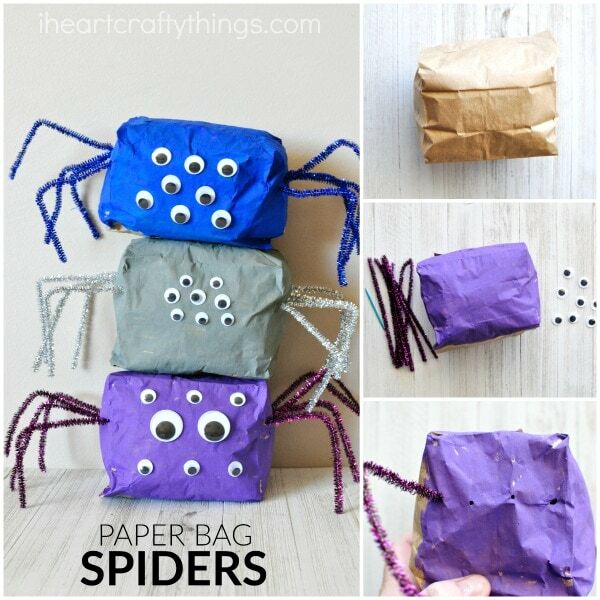 Poke your pipe cleaners into the holes on the sides of your bag, then make a bend in your pipe cleaner to shape the spider legs. 4. 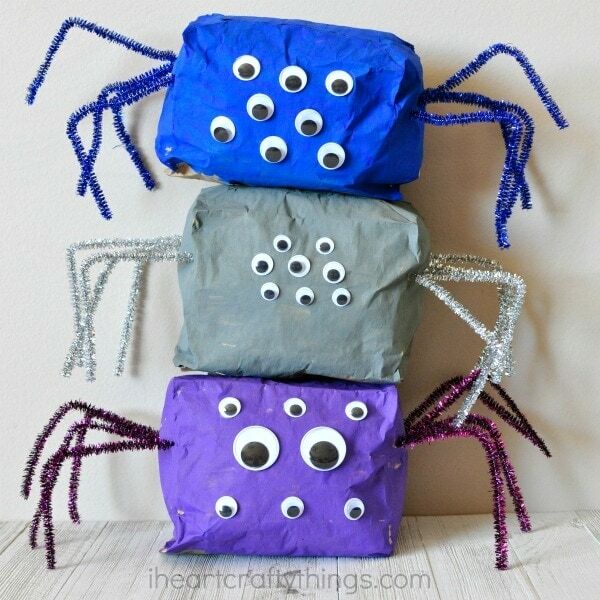 Finish your stuffed paper bag spider craft by gluing eight googly eyes onto your cute spider. If you decide you want to hang your awesome spooky spiders from the ceiling you’ll want to paint the back and bottom of your spider first. Then tape a piece of white string to the top of the spider and hang it up so it looks like it’s danging from a spider web.